Sometimes it is not easy to edit image PDF file produced from scanner etc., however, with PDF to Word OCR Converter, you can not only convert image PDF to editable Word file, but also recognize text of image PDF file according to different languages. For more details, please continue to read this article. 1. Please double click installer of PDF to Word OCR Converter for getting setup wizard of installation, then you need to follow this setup wizard in order to install PDF to Word OCR Converter successfully. Then, you will see path of PDF file appear in processing table. 3. To recognize text from image PDF file, you need to make sure which kind of languages PDF file contains mostly, then click one of “OCR PDF file (Language: …)” on dropdown list of “Output Options” on interface in order to recognize text of image PDF more accurately with OCR technology. For instance, in case language of PDF file is Germany, you need to click “10 OCR PDF file (Language: Germany)” on dropdown list. Here I type 2 in edit boxes of “From” and “To” so that only second page of PDF file can be processed later. 5. Finally, to recognize text from image PDF file, besides the above you need to take, you also need to convert image PDF to editable Word file. So it is essential to get a targeting format: if you want to set targeting format as DOC, please click radio of “MS Word Document”; if you want to set it as RTF, please click radio of “Rich Text Format”. 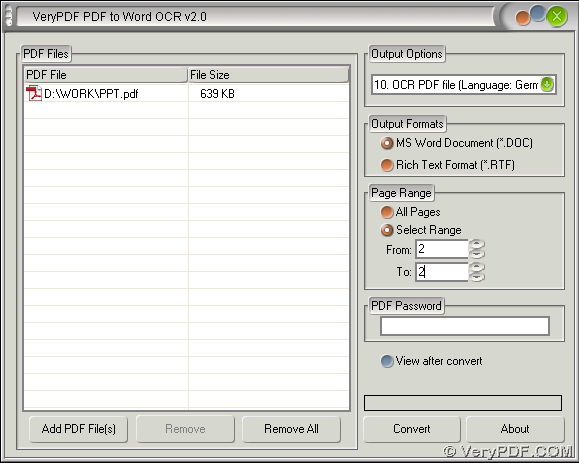 Then, you also need to get a folder for saving this Word file on your computer: click “Convert” button on interface of PDF to Word OCR Converter, then choose a folder in dialog box of “Save As” > click “Save”, automatically, this image PDF file can be recognized on text accurately with the way of Word file added in destination folder on your computer. Is it very convenient and flexible to recognize text with process to convert image PDF to editable Word? Yes, it is! So if you need to get more information of PDF to Word OCR Converter, please go to homepage of PDF to Word OCR Converter. 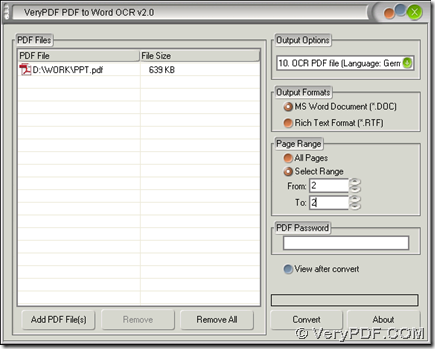 If you want to buy PDF to Word OCR Converter, you can log on order page of PDF to Word OCR Converter. How to extract text or recognize text from documents by cloud API? How to recognize Spanish words in image PDF? How to recognize French text from image PDF? This entry was posted in PDF to Word Converter and tagged image PDF to editable Word, recognize text. Bookmark the permalink.